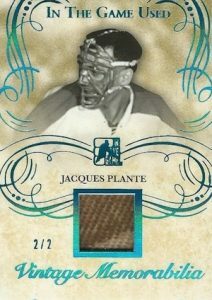 2016 Leaf In The Game Used Hockey builds upon the 2015 release, offering more memorabilia cards from hockey legends of yesterday and today. 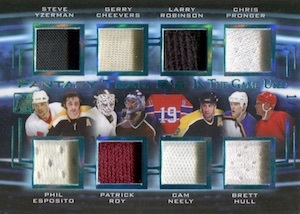 Each hobby box includes five relic cards. 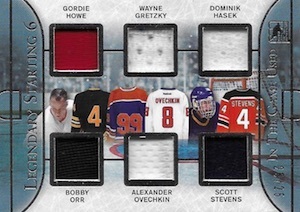 Although there is not a genuine base set, 2016 Leaf In The Game Used Hockey has plenty of options for collectors who want to own a piece of hockey history. 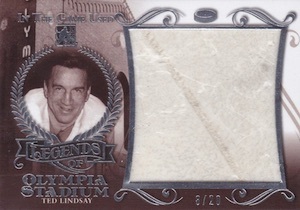 Legends of Chicago Stadium and Legends of Olympia Stadium contain pieces from the two beloved hockey arenas. 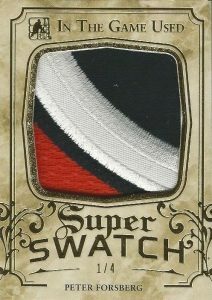 Other single-player sets include Locker Room Collection, Masked Men Memorabilia, Rare Materials, and Super Swatch, which has a super-sized patch parallel. 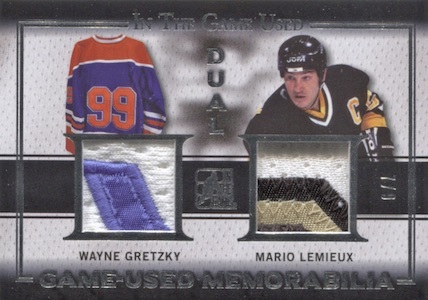 Putting together a hockey fan's dream team are the Fantasy 8s and Legendary 6 relic cards. There are other multi-player choices, too, including Countrymen and International Showdown. Collectors can also find single, dual, triple and quad options in the Game-Used Memorabilia set along with a patch parallel to chase. Having several sets to collect, vintage collectors are not forgotten with expanded Vintage Memorabilia cards that range from single-player relics to as many as eight different player swatches on one card. 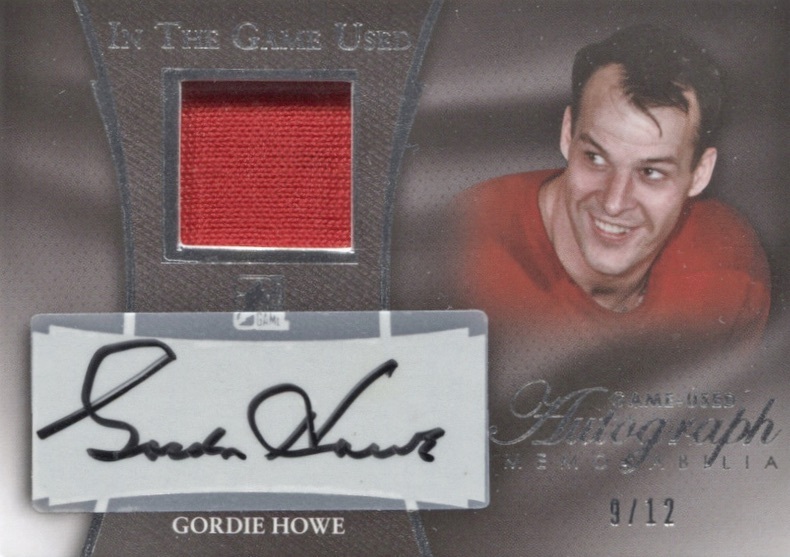 Although 2016 Leaf in The Game Used Hockey is relic-heavy, In The Game Used Auto and the very rare In The Game Used Dual Auto both add autographs to the game-used relic cards. SERGEI FEDOROV 2018 20 Leaf Invictus Hockey 3x Game-Used Jersey Patch Relic !!! 15 cards. Serial Numbered #/30 or as noted. PARALLEL CARDS: Gold #/9 (Card #GH1 - #/5), Red Spectrum #/4, Blue Spectrum #/3, Silver Spectrum #/2, Gold Specturm 1/1, Printing Plates 1/1. 7 cards. Serial Numbered #/7 or as noted. 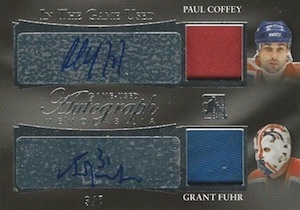 PARALLEL CARDS: Gold #/4, Red Spectrum #/3, Blue Spectrum #/2, Silver Spectrum 1/1, Gold Spectrum 1/1, Printing Plates 1/1. *All card #05 parallels serial numbered 1/1. 7 cards. Serial Numbered #/40. PARALLEL CARDS: Gold #/15, Red Spectrum #/10, Blue Spectrum #/5, Silver Spectrum #/3, Gold Spectrum 1/1. PARALLEL CARDS: Gold #/15, Red Spectrum #/10 or #/5, Blue Spectrum #/5 or #/3, Silver Spectrum #/3 or #/2, Gold Spectrum 1/1. PARALLEL CARDS: Gold #/20 or less, Red Spectrum #/5, Blue Spectrum #/3, Silver Spectrum #/2, Gold Spectrum 1/1. PATCH PARALLEL CARDS: Silver #/9 (Card #32 - #/5), Gold #/5 (Card #32 - #/4), Red Spectrum #/4 (Card #32 - #/3), Blue Spectrum #/3 (Card #32 - #/2), Silver Spectrum #/2, Gold Spectrum 1/1. PARALLEL CARDS: Gold #25 or #/10, Red Spectrum #/5, Blue Spectrum #/3, Silver Spectrum #/2, Gold Spectrum 1/1. 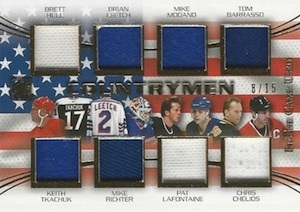 PATCH PARALLEL CARDS: Silver #/9, Gold #/5, Red Spectrum #/4, Blue Spectrum #/3, Silver Spectrum #/2, Gold Spectrum 1/1. PARALLEL CARDS: Gold #/20 or #/10, Red Spectrum #/5, Blue Spectrum #/3, Silver Spectrum #/2, Gold Spectrum 1/1. PARALLEL CARDS: Gold #/15 or #/10, Red Spectrum #/5, Blue Spectrum #/3, Silver Spectrum #/2, Gold Spectrum 1/1. PATCH PARALLEL CARDS: Silver #/6, Gold #/5, Red Spectrum #/4, Blue Spectrum #/3, Silver Spectrum #/2, Gold Spectrum 1/1. 5 cards. Serial Numbered #/45. PARALLEL CARDS: Gold #/20, Red Spectrum #/9, Blue Spectrum #/5, Silver Spectrum #/3, Gold Spectrum 1/1. PARALLEL CARDS: Gold #/10, Red Spectrum #/5, Blue Spectrum #/3, Silver Spectrum #/2, Gold Spectrum 1/1. PATCH PARALLEL CARDS: Silver #/7, Gold #/4, Red Spectrum #/3, Blue Spectrum #/2, Silver Spectrum 1/1, Gold Spectrum 1/1. PARALLEL CARDS: Gold #/7, Red Spectrum #/5, Blue Spectrum #/3, Silver Spectrum #/3, Gold Spectrum 1/1. PARALLEL CARDS: Gold #/5, Red Spectrum #/4, Blue Spectrum #/3, Silver Spectrum #/2, Gold Spectrum 1/1. PARALLEL CARDS: Gold #/5 or #/4, Red Spectrum #/3 or #/2, Blue Spectrum #/2 or 1/1, Silver Spectrum 1/1, Gold Spectrum 1/1. 10 cards. Serial Numbered #/12. PARALLEL CARDS: Gold #/7 (Card #MM-10 - #/5), Red Spectrum #/4 or #/3, Blue Spectrum #/3 or #/2, Silver Spectrum 1/1, Gold Spectrum 1/1. PARALLEL CARDS: Gold #/5 (Card #RM-05 - #/3), Red Spectrum #/3 (Card #RM-05 - #/2), Blue Spectrum #/2 (Card #RM-05 - 1/1), Silver Spectrum 1/1, Gold Spectrum 1/1. 42 cards. Serial Numbered #/45. PARALLEL CARDS: Gold #/25, Red Spectrum #/5, Blue Spectrum #/3, Silver Spectrum #/2, Gold Spectrum 1/1. PATCH PARALLEL CARDS: Silver #/5, Gold #/4, Red Spectrum #/3, Blue Spectrum #/2, Silver Spectrum 1/1, Gold Spectrum 1/1. PARALLEL CARDS: Gold #/5 or less, Red Spectrum #/3 or less, Blue Spectrum #/2 or 1/1, Silver Spectrum 1/1, Gold Spectrum 1/1. PARALLEL CARDS: Gold #/5 or less, Red Spectrum #/4 or less, Blue Spectrum #/3 or less, Silver Spectrum #/2 or 1/1, Gold Spectrum 1/1. PARALLEL CARDS: Gold #/4 or less, Red Spectrum #/3 or less, Blue Spectrum #/2 or 1/1, Silver Spectrum 1/1, Gold Spectrum 1/1. 6 cards. Serial Numbered #/5. PARALLEL CARDS: Gold #/3, Red Spectrum #/2, Blue Spectrum 1/1, Silver Spectrum 1/1, Gold Spectrum 1/1. PARALLEL CARDS: Gold #/3 (Card #VM8-02 - #/4), Red Spectrum #/2 (Card #VM8-02 - #/3), Blue Spectrum 1/1 (Card #VM8-02 - #/2), Gold Spectrum 1/1.